Denise Mullen Hauer hasn't added a story. I have been contemplating how to write this…… I’ve looked at my past, I’ve watched the news about the happenings in Ferguson, I continue to watch children grow sicker from awful diseases, and die and I’ve acknowledged the struggles of every single person I know. We ALL have our own mountains to climb and challenges to overcome. Despite the gigantic rocks that have been thrown in my journey of life and the ones that have fallen directly on top of me, all in all I have a wonderful life that I am grateful for and I wouldn’t change. Not everyone is as lucky as I am on this journey and even though we all get gigantic rocks thrown in our path from time to time, the only way around them, over them or underneath them is with the help of others. Last week I was traveling to different cities and speaking to many different folks of different backgrounds and cultures. One topic that came up in one of my presentations was the basic needs of children. 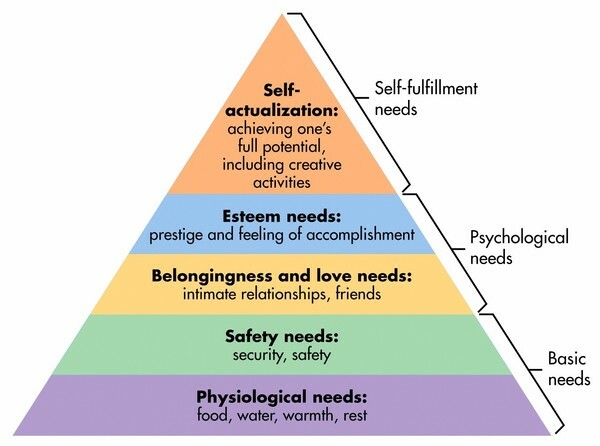 As I am writing this now, this very idea comes back to mind, but instead of children, I am remembering the good old “Maslow’s Hierarchy of Needs” pyramid for ALL humans. Because I thankfully find myself at the top of this pyramid at the time being, I wish I could pull everyone up with me! I can only do this one person at a time……. and a dear friend could really use my help……and YOUR help to move the gigantic rock that has once again fell directly on top of her. Mayte Jimenez finds herself lacking every human’s most basic needs. Without dragging to many personal details into this story, Mayte has confided some pretty scary details of her dire situation to me. At the moment Mayte is walking a tight rope to get her most basic need of food and water met. I’d like to assist her with that and bring her up a few levels so at least she can feel safe and secure in her environment and truly feel that she is loved and belongs on this beautiful yet bumpy journey. Some of you may know part of Mayte’s story. She lives in an unsafe part of Mexico and not too long ago held her only child as he took his last breath here on Earth. Unpleasantries of life continue to pile on top of Mayte though and she finds herself helpless, hopeless and desperate. She is working, but salary is very low and she is also helping support her elderly father whom has recently had heart surgery and is unable to work, her mother and her brother who has autism. They are living on $400 a month currently (the 4 of them.....paying for food, medication, minimal shelter and services) without any way to save any extra to move to a safer place to live. If you are in any position to help Mayte financially at this time, she and I would be so grateful. Denise Mullen Hauer hasn't posted any updates yet. Denise Mullen Hauer is managing the funds for this campaign. The campaign is for a personal cause.